A Mourne granite replica of the Downpatrick High Cross has been successfully put in place at the east end of Down Cathedral . This followed the removal of the original cross to Down County Museum for conservation and display in a new gallery to open next year. A momentous occasion. 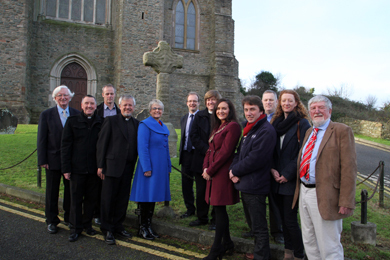 The Downpatrick cross was moved to Down County Museum in order to preserve it and a replica has been re-installed. 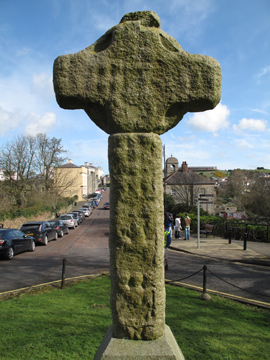 The cross was set up by the stone carvers, S McConnell and Sons of Kilkeel, who scanned the original and created an exact replica from granite quarried on Thomas Mountain, above Newcastle. The original cross stood at the foot of English Street up until 1729, when it was dismantled and the pieces dispersed around the town. Nineteenth century antiquarian Francis Joseph Bigger rebuilt the Cross with the help of Hastings Stone carvers of Church Street in 1897. While the reconstructed cross was held together with slate dowels in 1897, the new replica has been constructed using internal steel rods. The carvings on the cross have been recreated using scanning technology, in order to get as close to the original as possible. Work is still going on to study the carvings so that the biblical scenes can all be identified. The High Cross looking down The Mall in Downpatrick. Although there is no carving of Noah’s Ark (unlike on the Donaghmore Cross 5 miles north of Newry), the cross does show the heads of Adam and Eve, and Cain about to slay Abel – stories that everyone will know, and that watchers of the current film ‘Noah’ will have been reminded of. Above these is a very topical scene in that it is believed to represent Christ entering Jerusalem on a donkey on Palm Sunday, an event that began Holy Week and led to Christ’s Crucifixion, clearly shown on the head of the Cross, with the spear-bearer, and sponge-bearer and two thieves on either side. Speaking about the project, Down District Council Chairman, Cllr Maria McCarthy said: “The installation of the cross is the latest stage in the project to preserve the original cross (and many other Museum artefacts including the farming collection) within an Extension to the rear of the Museum, to be constructed from May 2014 to early 2015, while still enabling everyone to appreciate a replica in the position in which it stood for 116 years. 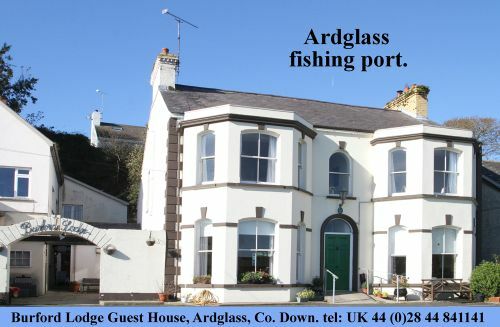 The Downpatrick High Cross Extension project is a partnership project between Down District Council, the Church of Ireland, the Northern Ireland Environment Agency and the East Border Region, and is part-financed by the European Union’s INTERREG IVA Cross-Border programme managed by the Special EU Programmes Body.